Advances in Cancer Research provides invaluable information on the exciting and fast-moving field of cancer research. Here, once again, outstanding and original reviews are presented on a variety of topics. 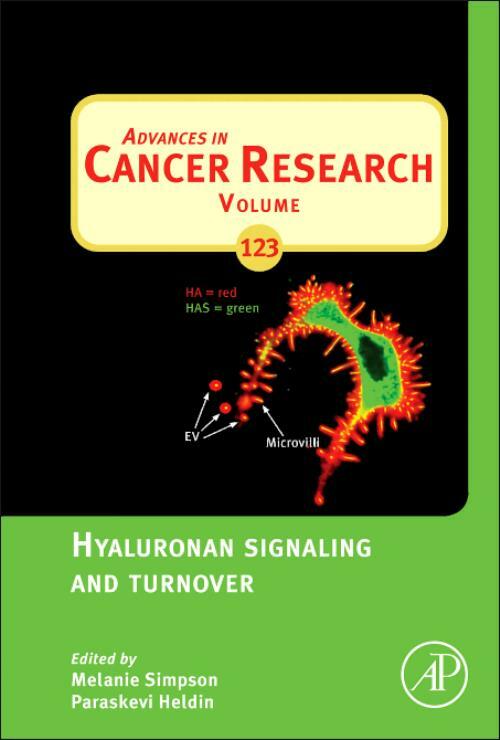 This volume covers hyaluronan signaling and turnover. Paraskevi Heldin, Ph.D., received her B.Sci. exam (Chemistry/Biochemistry Mathematics), Uppsala University in 1979 and her Ph.D., in Medical and Physiological Chemistry for studies on regulatory phosphorylation of proteins, Faculty of Medicine, Uppsala University, in 1987. After dissertation she changed research area and focused on the biology of hyaluronan under the supervision of Professor T.C. Laurent, Uppsala University. She worked at Department of Medical and Physiological Chemistry during 1987- 2000, and was awarded Docent appointment in Medical and Physiological Chemistry and Scientist Position from The Göran Gustafsson Foundation. Since 2001, she is Adjunct Associate Professor at the Department of Medical Biochemistry and Microbiology, and Associate Investigator and Head of the Matrix Biology Group in Ludwig Institute for Cancer Research, Uppsala, Sweden. Year 2013, she has appointed Adjunct Professor at the Department of Medical Biochemistry and Microbiology, Uppsala Unversity, Sweden. Dr Heldin's interests are focused on understanding the mechanisms of how hyaluronan-CD44 complexes interact with the receptors for the growth factors PDGF and TGFß for modulation of the proliferative and invasive behavior of malignant cells.